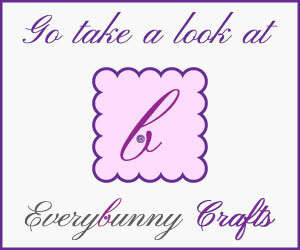 I originally started this blog because of the inspiration from my mom and her mom, and from my great grandma too. Little did I realize that my dad was also a strong influence in my life, artistically, creatively, and culinarily. 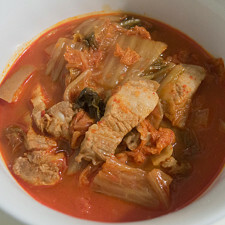 Many of these recipes that I learned from my mom were created because of my mom’s love for my dad, turning old recipes into new renditions, and to his tastes. And now that I’ve been married to the love of my life, I took these feelings for granted; I’ve only just realized that I, too, am making all of these recipes to my hubby’s tastes, just so that I can see his smiling face. That’s what I live for, every day. Difficult as it is to pick myself back up and write these posts, I knew that I couldn’t just stop. It may seem a bit hokey, but I now understand that this is my legacy. It’s the only thing I have that’s from my ancestors, even when it’s something simple as Gimbap! Gimbap (also spelled Kimbap; 김 – seaweed, 밥 – rice) is a staple in many Korean households. It’s something my mom made for my dad pretty regularly. 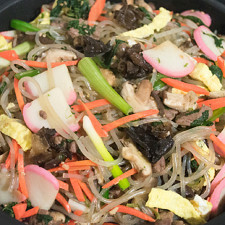 Just like Japchae, it has a protein that is central to the dish, with accompanying vegetables that brighten it. 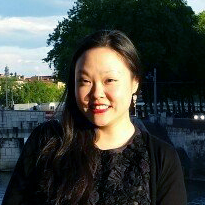 Gimbap is perfect for a picnic or office lunch, as it’s contained and easy to eat. I made this back in October for my hubby’s office lunch. It was just what we needed after eating sandwiches and hot deli food all week. My mom does this too. When we’re needing something different than our usual everyday dinner, she throws something like this into the mix! Even though it’s fairly simple, it’s just enough to make all of us smile and enjoy our meal that much more. Rinse the rice and cook according to regular instructions. While the rice is cooking, sauté the beef in some vegetable or olive oil, and season with a pinch of salt. Cook completely, and set aside on a plate. Slice the fishcake sheets into ½-inch strips, and sauté them in some oil as well, about 3 minutes. Place onto a plate. Scramble the eggs and fry them up in thin sheets, trying to not get any color on them. Once cooked, place the egg *crêpes* onto a cutting board to cool. Wash the spinach thoroughly and blanch them. Shock them in some ice water to stop the cooking. Drain and gently squeeze out the water. Set aside. Shred or matchstick the carrots, and heat them through with a little oil and a pinch of salt, about 2-3 minutes. Set this aside with the rest of the ingredients. Slice the tube of pickled radish into strips of ½-inch thickness. Put these with the rest of the vegetables. Wash and dry the perilla leaves. To make your rolls: scoop all of the rice into a large bowl. Taking a spatula, toss the rice gently until it stops steaming, but still warm. Add the sesame oil, salt, and rice vinegar, and mix well. As you are tossing the ingredients together, allow the rice to cool down further, until it is closer to room temperature. Place a sheet of seaweed onto the rolling mat, and take about a fifth of the rice. Spread the seasoned rice into a thin layer. Take a couple of perilla leaves and lay them in the middle of the roll. 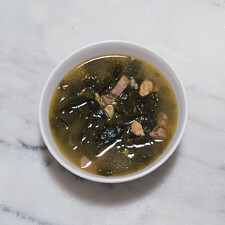 Put the beef on the leaves, and then proceed to place portions of the other ingredients along the bottom half of the roll (a little beef, 1-2 strips of fishcake, a few leaves of spinach, a few pinches of carrots, 1-2 strips of egg, and a strip of radish). Roll the gimbap by using the mat, lifting the bottom edge upward and tightening the roll as its being formed. Roll completely and set it onto a large plate. Finish the rest of the rolls, line them up side by side, and brush on some sesame oil onto the tops of each roll. Sprinkle some sesame seeds to garnish. Take a sharp knife and cut the rolls into ½-inch slices. Arrange onto a serving plate. Serve the yummy gimbap with some soy sauce splashed into a shallow dish, and enjoy! I use whatever shortgrain rice there is at home. It's nice to use something like sushi rice, but it isn't absolutely necessary. Something that has a natural sweetness and stickiness is great for gimbap. I've also added a touch of barley and some millet seeds into the rice, but it isn't required. Find all of your ingredients at your local supermarket Asian food section, or go to your local Asian grocery! You'll be able to find everything you need there! Thinly sliced rib eye, eye of round, or tenderloin are the go-to for gimbap. The fishcake that I get from the store is the one that comes in flat sheets and in a multi-pack. Don't worry about the quantity. Take out what you need for use, and freeze the rest for another day. Or another recipe! 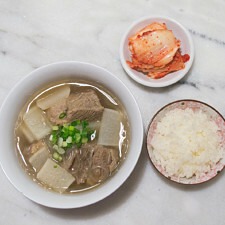 The pickled radish is called danmuji (단무지). 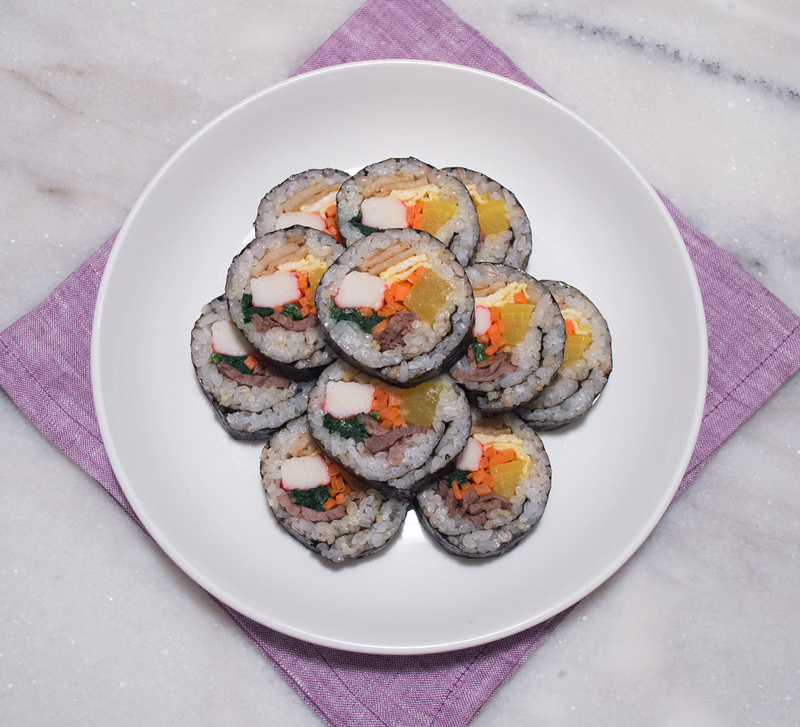 It's a yellow or off-white long radish that's just right for gimbap. If you can't find perilla leaves, it's okay. I just like to add them into my gimbap because it gives extra flavor and fragrance to the rolls. It also keeps the sliced beef contained, making it easier to slice the rolls. After putting the rice in the cooker or the stove, you have, roughly, 30-35 minutes to prep the filling. I like to do all of the chopping and slicing first, so I can focus on cooking all of the ingredients from the beef to the eggs, without having to hover back and forth from station to station. Although, sometimes, I don't have a lot of space in my tiny New York City kitchen, so I find myself prepping half of the ingredients, and then working on the other half. Cook, blanch, chop, and slice however it fits for you. As long as you have all of the ingredients prepped before rolling, you're good to go. I like to cool my rice down almost to room temperature before rolling because it can steam the seaweed and create ripples. This also can make tears in the seaweed when rolling. Not everyone likes vinegar in their rice. It's more of a Japanese thing, and not very characteristic of Korean seaweed rolls. Plus, you have the addition of the pickled radish, which gives you that tang. I like to add some to supplement the entire roll, but you can choose to leave it out. If you look closely, you'll notice that there's a shiny side and a matte side to the seaweed. I like putting the shiny side outward, so the filling and rice are placed on the matte side of the sheet. It's mostly an aesthetic thing, so don't worry too much about it; I just prefer the shiny side to face out because it's a smoother surface to work with when brushing the sesame oil and cutting into the rolls. We all like a lot of filling, but try not to over-stuff the rolls as they can only take so much filling before they burst. Make sure you have enough filling to go around for five rolls, and if you have any left over, you can always make more! If you don't own a rolling mat, don't worry. It does take a little extra maneuvering, but you can roll your gimbap straight on a cutting board. If you do need some assistance, place a tea towel down and a sheet of parchment on top of that, and use the parchment to help you roll. I cut my rolls into 10 pieces, about a ½-inch in thickness. The first cut will be almost a ¾-inch from the edge, slicing the end off for a clean cut into the next slice. I slightly wet my knife to get the slicing started on each roll, and wipe every few cuts. It helps keep the pieces clean and tight. Sometimes the gimbap has enough balance in flavor that you don't need to use soy sauce. 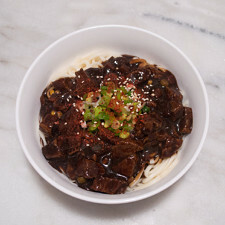 My hubby still likes a bit of that extra salinity and soy flavor, so I always put out a small bowl of soy sauce for him. Made our Recipe for Gimbap (김밥) - Seaweed Wrapped Rice with Meat and Vegetables? It’s easier to roll when the ingredients are tiled closer together, but for purposes of seeing all of the ingredients, I’ve laid it out in a flat spread. 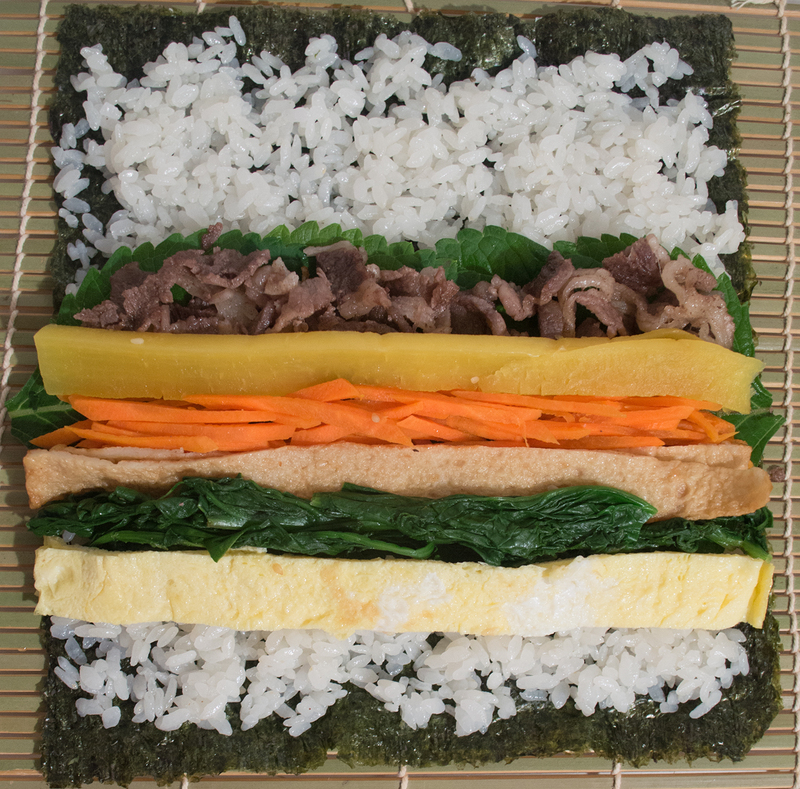 No thoughts on "Gimbap (김밥) – Seaweed Wrapped Rice with Meat and Vegetables Recipe."